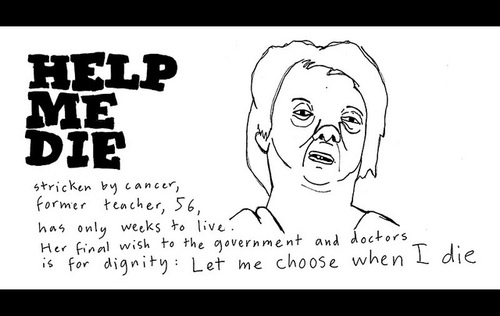 Euthanasia also known and mercy killing, is a painless way of terminating one�s own life. It is when a patient is suffering from severe illness or an incurable disease which involves going through a painful process of treatment yet the end result being eventual death, the patient asks for physician�s assistance for a permanent relief i.e. in simpler words asking the doctor to kill you. 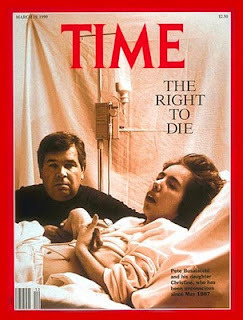 Some are in support of Euthanasia saying it�s a right of every individual to decide whether they want to live or not, to allow them to die with dignity and self respect, to not be a burden on their spouse and family, to be able to live for as long as they can live healthy and choose death for themselves when they cannot. Whereas some strongly oppose it and say that Euthanasia is disrespect to human life, and a challenge to God. Nobody has the right to choose when to terminate their own life; it is a gift of God, it should be accepted and cherished with even the very little you have. People who choose to terminate their own life on the hospital bed are thinking rationally for themselves because they know all they are left with is pain and every minutes torture, when eventually there sickness will take their lives why not do it now and ask for it. Same goes for the patients attendants, if a patient is in a comma and the his/her loved ones decide to end his/her life because they know that he or she will die soon and they refuse to see that person go through so much pain. Is that a justified logical and rational decision to make in any way? 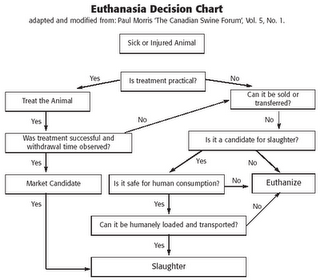 Decision chart for animal .